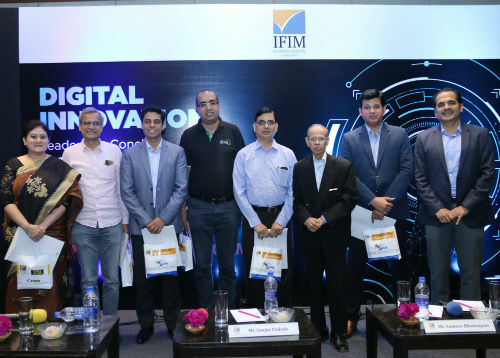 Bangalore: IFIM Institutions, in partnership with the Government of India and NASSCOM, hosted their Digital Innovation Conclave, which aimed to bring out the importance of a Public-Private Partnership for improving the employability quotient of a skilled India. Prof Sadagopan, Director(President) of IIIT-Bangalore, Mr. Sanjeev Malhotra, CEO, IoT, NASSCOM, Dr Ramesh U representing AICTE, Government of India and Mr. Sanjay Padode, Secretary, Center for Developmental Education (IFIM Institutions) together inaugurated the session. Understanding the role of analytics in shaping the career of future professionals, previously, IFIM institutions with NASSCOM had sketched out unique model of ‘Train the Trainer’ in three courses- Associate Analytics, Junior Data Analytics and Recruitment Associate. The program was Level 7 and intended to skill 10,000 Post Graduate students across state. According to an independent research report, the $155-billion Indian IT sector employs around 3.9 million people, and McKinsey estimates that the skillsets of half of the existing workforce will be irrelevant as they are not skilled to be in tune with the changing market needs. The Conclave culminated with the formation of a Think Tank in Digital Business chaired by Prof Chandrasekhar, Chairman of Centre of Excellence for Business Analytics at IFIM Business School. Mr Sameer Dhanrajani, Chief Strategy Officer, Fractal Analytics announced the names of the invited members of this Think Tank and handed over the invitation letters. The Think Tank will be supported by a research group consisting of students and faculty, led by Prof Chandrashekhar, the renowned name in Data Analytics in country. This Think Tank shall develop a well-researched white paper for consumption by the Industry and Academia at large. The paper shall endeavor to outline the curriculum changes and development of coursework to align the present programs with the digital needs of the industry in the future. 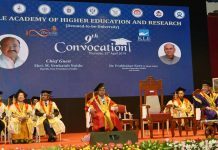 This paper would be presented to the Chairman of AICTE, UGC and would be circulated to the academic heads of all universities and institutions in the country.